The MODINICE M1 PC combines the practical demands of millions of office PC users with sophisticated design. The MODINICE M1, a computer, combines the best of Apple's design philosophy with the practical requirements of millions of office workers because it has an attractive and ergonomic design, may easily be upgraded, can be used with one or two monitors of the user's choice, is Windows-based, and is available for only half the price of an Apple iMac. Through this device, MODINICE is revolutionizing the multi-billion market for office computers. Computers have radically changed the world of work, and there is hardly an office without a computer nowadays. Even though digitization progresses continuously, innovation has been rare within the market for office computers over the last 25 years. If one compares the design and hardware of an office computer 25 years ago with those of today's systems, there are some striking similarities. This monotony is one of the reasons why Apple's design concepts are so popular. The Apple iMac in particular is a product that takes aesthetics to a new level because the actual computer is invisible and integrated into the monitor, and this device also improves ergonomics and operational safety, for instance by reducing the number of tangled cables in the workplace. i. In Businesses, the Share of Windows Users Is Approximately 90 %. Despite a perceived lack of "coolness," Microsoft Windows is an integral part of everyday business, and over 90 % of office systems are running Windows.1 In many cases, a change of the operating system is not an option because important office software (e.g., many SAP solutions or leading accounting system DATEV) require Windows, which makes the use of this software very difficult on Mac systems. For businesses, upgradability is a particularly important aspect in the purchase of office computers. Office computers are meant to last for five years, for instance to benefit from tax advantages. Such periods are hard to achieve in practice without upgrading the computer (e.g., its CPU and hard drive) at least once and without losing productivity. Apple systems are notoriously difficult to upgrade. "Hard to repair and upgrade. Rating: 1 out of 10 possible points"
"Upgrade Impossible: Apple Solders RAM in New iMac"
"Useless 4k? Small Apple iMac difficult to repair and upgrade"
Both the price and the maintenance cost of Apple systems are higher than those of Windows systems. For instance, a MODINICE system with similar hardware (CPU performance, hard drive capacity, etc.) is available for roughly half the price of an Apple system. Because of the large number of service providers (system administrators, system houses, etc.) for Windows, the cost of maintenance is also lower on average. The current price of an iMac 21.5" is €1,699 (for the version with a 21.5" 4K display, 8 GB of RAM, and a 1 TB hard drive). The MODINICE M1 with a similar performance costs €469. It may be combined, for instance, with a 23.6" 4K monitor for €379 (Acer K242HQ), which would lead to a total price of €848. Consequently, it is precisely half as expensive, but it has a larger monitor. Our company founder and managing director Mike Finckh has worked in the computer industry for as long as 30 years, and he started dealing with available alternatives to expensive Apple products that are suitable for offices approximately three years ago. After intensive research, however, he could not find any alternative product that met the typical requirements for office computers. This fact, along with his many years of experience in hardware production in Asia and in international B2B sales, finally motivated Mike to found MODINICE, thus combining the best of the acclaimed Apple design philosophy with the everyday requirements of millions of office workers for the first time. Over the last three years, we have been working systematically on the first MODINICE model ("M1"), thus paving the way for an entire product family with a similar DNA. As a first step in our system's development, we analyzed the requirements of companies in terms of office computers. For this purpose, we talked to numerous typical users and decision-makers in businesses in order to understand their practical needs, worries, and problems. While doing so, we analyzed both aspects of usability and ergonomics in the workplace (e.g., the space required on small desks or the trend toward multi-monitor systems) and financial aspects of purchasing (e.g., the possibility of reordering components for a long time, certain aspects of pricing, service costs, and product life). Moreover, we had intensive discussions with administrators, system houses, distributors, and sellers, for these are the channels through which customers get their office computers. Apart from the aspects also important to purchasers, there are financial aspects (especially margins) and logistical aspects (availability, replacements, etc.) important to sellers (and intermediaries). After covering requirements in terms of functionality and logistics, we focused on the design and ergonomics of our product. During several iterations and workshops, we collected our team's and our partners' ideas and designed the first prototypes of our product in collaboration with renowned industrial designers. While doing so, we made not just 2D and 3D drawings, but also physical mock-ups. Moreover, we tested, abandoned, and improved our numerous drafts. Ultimately, the computer's current design emerged: All the electronics, components, and cables are now hidden inside a vertically oriented monitor stand. In this way, our system not only prevents tangled cables, but it also creates a large personal workspace for users. In addition, users may connect one or even two monitors to the computer through a monitor arm. Last but not least, the chimney-like design of our computer enables highly efficient cooling; the cooling system has to be activated (i.e., the fan has to run) only if the system is experiencing high load, and it is usually completely silent because it dissipates heat passively. Moreover, we have integrated some other helpful detail solutions that are still globally unique as far as we can tell. For instance, our system has an integrated wireless charging feature that enables inductive charging of devices such as smartphones. Finally, we have combined the power cable and the network cable, so there is only a single cable (a Y-cable) coming out of the case that splits into two ends right before the network socket and power outlet commonly available in offices. We then created a limited number of fully functional prototypes from the results of the design stage. While doing so, we optimized various aspects relevant to production. For instance, the exact design and choice of materials for the individual components are relevant to pricing, and production processes (as well as maintenance and upgrading processes) have to be as easy and fast as possible and require only few tools. We have also provided select customers and specialized sellers/distributors with the prototypes for beta testing and used these people's feedback to make small but important improvements to the final version of the M1. After completing the three stages of product development, we were able to start mass production in the beginning of 2016. At this very moment, production of the first batches is being completed by our contractor in China, and these batches will most likely be delivered to our distribution department and our own web store in Germany from February 2016. Our production partner in Asia possesses a comprehensive infrastructure that will enable us to scale up production to large volumes quickly and easily without having to invest in the machinery necessary for production ourselves. Consequently, we are able to react quickly to increasing demand and to deliver as many additional products as necessary within a short period of time. The successful start of mass production has also enabled us to fully focus on the marketing and distribution of our product. The MODINICE business model consists of the lucrative distribution of office computers via multipliers (e.g., distributors, wholesalers, or system service providers). This approach of marketing products through wholesale is indispensable in the B2B segment, and it provides us with a significant advantage in terms of scalability at relatively low marketing and sales costs. Indeed, success depends not just on a "great product," but also on the fact everyone involved in the cycle – from production to sales – adequately benefits in a financial sense. In spite of the typical sales price of only €530, we are reaching an attractive gross margin of 18% although this price is roughly 50% lower than that of an Apple product and although we have included a margin of 5% for distribution and 15% for sales in the price. Therefore, we are offering a highly attractive product that is a pleasure to sell not just for us, but also (and especially) for wholesalers etc. This is why we believe we are in pole position and are ideally positioned in terms of sales. By continuously increasing production volumes, we will be able to further reduce both production costs and logistics costs in the future. Focusing on the market for office computers that has hardly seen any innovation for 25 years, MODINICE has created a solution with readily apparent added value and many competitive advantages. Compared to all-in-one PC solutions, for instance, we are offering a particularly ergonomic and stable product because our users can choose the monitor they like (that is, one or two monitors by any brand, no matter whether these are conventional monitors or touch screens). Mini-PCs cannot compete with the MODINICE PC either because their performance is significantly lower. Desktop PCs, on the other hand, do not offer state-of-the-art design, take up much space, and require many cables that tangle easily. Consequently, there is currently no product available on the office PC market that offers similar performance, design, and ergonomics at such a low price. To protect this competitive advantage, we registered several aspects of the MODINICE PC/design with the German Patent and Trade Mark Office (DPMA) before we started selling our PC. The market for office computers is a classic B2B market with a two-tier structure consisting of wholesale ("distribution") and retail ("system house/integrator/retailer"). Because of our long experience within this market, we have known the most important distributors for decades. Therefore, we have already signed agreements with Ingram Micro (the largest distributor) and Also (the third largest distributor). As a result, we now have indirect access to the more than 35,000 system integrators and sellers in Germany, Austria, and Switzerland, which may in turn market our product to over 3,600,000 B2B customers. Aside from B2C marketing through distributors, we have also created a second marketing channel for our products – our own online store (www.MODINICE.com) – which also helps us showcase our products. Financially speaking, however, this second channel plays only a minor role because we expect other sellers to also offer MODINICE systems online shortly. Our target group includes companies from all economic sectors. In other words, we are focusing on a huge target group consisting of approx. 3,600,000 companies in Germany alone. We have already ensured access to the largest part of this target group with the help of our sales partners. The market potential is huge; in Germany alone, more than 3,000,000 office computers are sold every year. Consequently, the annual volume of the German market alone is more than €1,5 billion, and this volume is still on the rise. On a global scale, the potential is even greater: With roughly 145 million office PCs sold every year, the annual market volume amounts to approx. €50 billion. 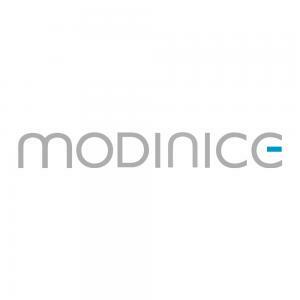 Our patented MODINICE M1 will provide a basis for our future success. Using our considerable expertise in developing new products, we can use the same methods when accessing additional segments of the computer market. Consequently, we will also focus on the potential of related segments in the future (in addition to the lucrative German market consisting of more than 3,000,000 office PCs). We plan to use the capital raised on Companisto primarily to expand our sales team and to develop additional products using the method we have developed (the "MODINICE principle"). The most interesting aspect of our B2B sales model is its high efficiency compared to costly B2C marketing. By cooperating with the largest distributors in Germany, we are creating a significant multiplier effect, because one of our partners covers a large number (i.e., thousands) of system integrators, all of which have a multitude (i.e., hundreds or thousands) of own customers. The advantage of this approach is readily apparent: Unlike in the case of consumer marketing, we are focusing on only a small number of distributors/specialized sellers, which we support through B2B marketing/PR and sales training (e.g., at professional fairs). In this way, we are reaching a large number of customers in a fast, easy, and cost-efficient fashion.